Finished in Black Sapphire Metallic with a matching black interior and Carbon leather highlights, the build numbers shrink down to 1 of 338 in this color combination. The exterior is highly polished and shows near new. Inward, the heated power sport seats blend well with the Carbon leather throughout the interior. This car is in beautiful shape thanks to meticulous upkeep and like-minded owners. Features including power windows, central locking, tachometer, steering wheel controls, premium stereo, cruise control, and A/C. The coveted Z4 M features a 3.2 liter, dual overhead cam, inline 6 cylinder with variable valve timing, four valves per cylinder, and 11.5 compression, which makes 330 horsepower and 262 lbs of torque! Strictly optioned with a 6 speed manual transmission, this Z4 M is built to be driven by a true enthusiast. This BMW drives better than most other cars on available today. It takes bumps politely, shifts crisply, corners hard, and stops on a dime. Having been garage kept and only having 30,496 miles, this BMW is a true testament to meticulous care. The Z4 M Coupe is a future classic without a doubt, so get one while prices are fair!! A thorough TLD detail has just been performed so stop by our showroom and see how nice this Bimmer really is, down to The Last Detail. Just Completed a 500 Mile Tour! This car features the 1,798 cc 4 cylinder engine, with dual SU carbs, and is backed by a 4 speed transmission. It produces 95 horsepower and is an absolute gas to drive! At the time of restoration and the drivetrain was removed and rebuilt top to bottom. As with the rest of the build, the brakes are brand new and stop the car quickly while the suspension takes the bumps appropriately, keeping this MGB planted to the road. With a premium restoration, and having just completed a 500 mile trip, this well sorted MGB is ready to roll. A through TLD detail has been performed to ensure that this car meets our strict standards. So stop by our showroom to see how nice this investment grade MGB really is, down to The Last Detail! This Burnt Orange, fully customized 1936 Ford Sedan (Lot #634) will cross the block at the 3rd Annual Hot August Nights Auction presented by Barrett-Jackson. RENO, Nevada – July 23, 2015 – Barrett-Jackson, The World’s Greatest Collector Car Auctions®, is building an exciting docket of custom vehicles for the famous Hot August Nights auction, held August 6-8, 2015, at the Reno-Sparks Convention Center in Reno, Nevada. Hot August Nights is the premier event for hot rods and custom vehicles and Barrett-Jackson has built a docket that largely complements that theme. Among the most anticipated consignments is a collection of Fords including the 1936 Ford Custom Sedan (Lot #624) finished by Count’s Kustoms, utilizing a Corvette C4 suspension and a GM crate Ram Jet V8 engine. The highly-anticipated 1936 Ford Custom Sedan (Lot #624) is dressed in a stunning, Burnt Orange custom paint, custom pinstripes and airbrush fades. This over-the-top build was finished by Count’s Kustoms and carries an array of eye-catching features. This hot rod rides on Corvette C4 suspension and adjustable air ride shockwaves, and is powered by a GM crate Ram Jet V8 with electronic fuel injection and a 4L80E automatic overdrive transmission. Inside the all-steel body, the black leather and suede interior is accompanied by power seats, windows and sunroof. Another Ford custom, appropriately titled “Mellow Yellow,” showcases an outstanding build on an all-steel, fully streetable ’34 Ford Roadster (Lot #634). Under the hood, this custom Ford features a HEMI engine boasting approximately 600 horsepower along with a hydraulic roller cam and lifters, adjustable roller rocker arms, dual carburetors, custom aluminum radiator and dual electric fans. Built to show-winning and concours quality, this build has seen only 760 miles since completion. Also sure to be a fan favorite in Reno Tahoe is a ’56 Ford F600 Custom Pickup (Lot #646). The truck was transformed from a single-cab 22-inch flatbed F600 into a 4-door cab that features Swedish leather and a five-screen DVD stereo entertainment system. Other custom additions include hand-formed front and rear roll pans, a one-off machined console center, hand-built running boards, 2005 Denali bucket seats and a fully polished Ram Jet engine that cranks out 502 horsepower. Consignments for the 3rd Annual Hot August Nights Auction are still being accepted, with Reserve and No Reserve options available. To consign a vehicle in the Reno Tahoe auction, click here. 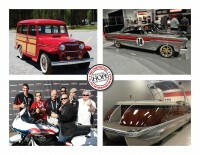 For more information on becoming a bidder, follow the link to www.barrett-jackson.com/bid. Two 2015 Dodge Challenger SRT Hellcats (Lot #642 and Lot #643) lead the Robertson Collection into the 3rd Annual Hot August Nights Auction presented by Barrett-Jackson. RENO, Nevada – July 21, 2015 – Barrett-Jackson, The World’s Greatest Collector Car Auctions®, will auction several muscle and late model cars from the Robertson Collection on Aug. 6-8, 2015, at the 3rd Annual Hot August Nights Auction in Reno Tahoe, Nevada. A pair of all-new 2015 Dodge Challenger SRT Hellcats are destined to be crowd favorites as they roll across the block. The two all-new 2015 Dodge Challenger SRT Hellcats are sure to rev up the crowd in Reno Tahoe. Based on the Dodge Challenger, the Billet Silver Metallic (Lot #642) and Sublime Green Pearl (Lot #643) SRT Hellcats each feature a supercharged 6.2-liter HEMI V8 and a 6-speed manual transmission. Both are equipped with an SRT-tuned Bilstein 3-mode active suspension that helps keep all 707 horsepower planted firmly on the road. The Hellcats together have less than 200 combined miles, with the Sublime Green Pearl having clocked only 15. Also crossing the block in Reno Tahoe is a Kosmos Red and Black 1955 Chevrolet Nomad Custom Wagon (Lot #638). The engine is 348ci, bored 0.60 over and has only 187 miles on the build. From the front end to the rear end, this 6-speed custom is completed with top-of-the-line parts, including the suspension, console gauges and two different-sized wheels. The Robertson Collection also includes a 1964 Corvette Custom (Lot #644) finished in 2014 Mercedes-Benz Black paint and sporting an LS2 6.0 fuel-injected engine. Since its frame-off build was completed in 2014, this American classic has seen on 275 miles. Also heading to auction is a meticulously restored 1966 Corvette Convertible (Lot #702). One of only 2,111, this convertible is finished in Mosport Green with matching removable hardtop and features a 327ci V8 engine, correct 350 horsepower intake and a 4-speed manual transmission. Two additional examples of ’70s-era GM muscle from the Robertson Collection include a 1970 Pontiac Trans Am (Lot #703) restored in factory-correct Polar White with a blue interior and a 1971 custom Camaro (Lot #640) with an extensive list of components, including a supercharged 418ci LS3 engine pushing out 710 horsepower. Multiple Show Winner w/ Trophies!! Thorough Restoration In and Out! Refinished in its original birth color of Desert Rose, this TBird is complemented by a white interior with black soft top. The exterior is highly polished and the trim work and lenses are all in nice condition as well. The interior features a power bench seat with leather and matching trim throughout and contrasting back carpet. Noted features are power windows, wide white wall tires, the Volumatic signal seek radio, a rear deck mounted antenna, heat/defroster, and air conditioning. Still housing the original 292 V8, this Tbird produces 212 horsepower and 297 pounds of torque and is backed by a three speed automatic. Being completely rebuilt, the engine features hardened seals and recent service work so it runs like new. Driving this car is a dream, it starts easily and shifts smoothly through all gears. The power steering works smoothly and the disc brakes are dialed in too. Factory markings are as shown in the photos as well. First generation T-Birds are the most desirable ever produced and this is one of the finer examples available today. With the ideal colors, A/C, and a whole bunch of trophies, this TBird is a sure winner. Stop by our showroom and see how nice our 57 Thunderbird really is, down to the last detail! RENO, Nevada – July 7, 2015 – Barrett-Jackson, The World’s Greatest Collector Car Auctions®, will feature TV, racing and DUB Magazine vehicles from the famous Day Family Classic Cars Museum beginning Aug. 6-8, 2015, at the 3rd Annual Hot August Nights Auction in Reno Tahoe, Nevada. The five Mustangs, including one signed by Steve Saleen and Parnelli Jones as well as a pair of KITT cars that starred in NBC’s 2008 movie reprise of the hit TV series “Knight Rider,” are a part of the Day family’s collection, which is home to more than 100 classic and late-model vehicles. The 2008 Ford Mustang GT was the inspiration behind NBC’s movie reboot of the hit TV series, “Knight Rider.” The movie’s hero KITT was inspired by the 2008 Shelby GT500KR, as was its “Attack Mode” KITT persona. Both vehicles feature a 4.6L V8 engine. The KITT supercar also sports a Ford Racing Whipple Supercharger to produce 400 horsepower, has a Ford Racing handling package and plays the soundtrack from “Knight Rider” when activated. The “Attack Mode” KITT features performance upgrades, including a Ford Racing suspension package, Ford Racing mufflers and a special brake for executing the perfect 360-degree maneuver. Signed by Steve Saleen and motorsports legend Parnelli Jones, this 2007 Ford Mustang Saleen Parnelli Jones Limited Edition is Number 113 of only 500 produced. Cranking out 400 horsepower with a 302ci V8 engine, this limited-edition racer is dressed in Grabber Orange with black trim and features a shaker hood. Modifications made to this limited edition include forged pistons, rods and crankshaft, a light-weight aluminum flywheel and high-performance exhaust. “American Idol” TV stars Ryan Seacrest, Simon Cowell, Randy Jackson, Paula Abdul and Kara DioGuardi signed the 2008 Ford Shelby GT Barrett-Jackson Edition Coupe from the Day collection that will be auctioned in Reno Tahoe. Forged from the collaboration of Barrett-Jackson, Ford Motor Company and Shelby America, this 319-horsepower muscle car is Number 8 of 100 cars built and has only 326 miles. Also crossing the block in Reno Tahoe is a 2011 Ford Mustang Custom DUB Edition Coupe developed by ROUSH Industries. Famous from its TV appearance during a WWE event in Detroit, Michigan, this DUB edition Mustang is black with black stripes and features DUB logos, a hood scoop, tinted windows and special 20-inch wheels. Live coverage of the 3rd Annual Hot August Nights Auction presented by Barrett-Jackson will be broadcast in high-definition TV on Velocity and Discovery from Thursday through Saturday, Aug. 6-8. For more information on becoming a bidder, follow the link to . Classically finished in black, with a matching black leather interior this SL is simply timeless. Having been stored seasonally and garaged in the summer months, the stealthy exterior of this SL is in exceptional condition. Inward, the heated & ventilated multi-contour Massaging seats are some of the most comfortable available. Highlights include Keyless Go, Walnut Wood Trim throughout, AM/FM Stereo with a CD changer, panoramic roof, books, and myriad of other convenience items. Under the hood is the 5.0 liter V8 that produces 302 horsepower and 339 pounds of torque and is backed by the 5 speed automatic. Driving this SL is simply a dream. Hit the keyless go, and off you go. Whether you are carving through the back roads or just going to the store, this SL is at home anywhere. The panoramic glass roof only takes a matter of seconds to drop down and fold away. A thorough TLD detail has just been performed to make sure that this car meets our strict standards. This IS the nicest SL on the market today. So stop by our showroom, drop the top, and see how immaculate this SL really is, down to The Last Detail. The immaculate exterior of this XK is finished in Indigo Blue and complemented by a Caramel leather interior and a contrasting navy soft top. Having only 1,076 miles and been garage kept since new, the exterior is flawless. Inward, leather wraps you in comfort while Burl Walnut adds a touch warmth. This XK features items like adaptive suspension damping, xenon headlamps, parking sensors, power heated seats with memory, Bluetooth connectivity, HD radio, a touchscreen navigation system, and 20 Wheels. The XK is powered by the 5 liter, V-8 that produces 385 horsepower and 380 pounds of torque. Backed by a six-speed automatic with paddle shifters that is capable of gearshifts 30 percent quicker than previous mo. This XK Coupe animal is very docile around town, but once you mash the gas, the beast comes alive! This car is capable of 0-60 in 5.0 seconds! Driving this XK is simply a dream. Press the start button and off you go, whether you are carving through the winding back roads or just going to the store, this XK is at home. A thorough TLD detail has just been performed to make sure that this car meets our strict standards. Stop by our showroom, drop the top, and see how nice this XK really is, down to The Last Detail. Presented in the proper Buick colors of Moderne Grey and Black and a contrasting Beige interior, this Victoria is perfection. The lines of this Buick flow gracefully from front to back and are accented by the original stainless and chrome which are in pristine condition. The mascot and vent work are all a nod to the art deco period. Inward, the cloth interior is custom fitted to the car and beyond plush. All gauges and dash work have been restored to working order as well. Pop either side of the hood and youll find the meticulously detailed 233 cid straight eight, which produces 93 horsepower and is backed by a 3 speed manual transmission. This fully rebuilt drivetrain is whisper quiet and drives as well as it looks. No expense was spared and it shows. This Victoria is the finest example of a well sorted restoration done correctly. A thorough TLD detail has just been performed to make sure that this Buick meets our strict standards. Stop by our showroom and see how nice this Buick really is, down to The Last Detail.